Blasting and explosives industry studies have proven that containing (holding in) the explosive gases and energy within the rock mass for milliseconds (ms) longer than normal blasting methods, will increase rock fragmentation, as well as reduce stemming ejection, air blast and fly rock. However, more often than not, increases in rock fragmentation and reductions in air blast and fly rock, are not visible to the “naked eye”. The best way to measure increased fragmentation and improved blast performance is a statistical analysis. The next best way to measure is to simply monitor the tangible and intangible down stream costs and effects associated with overall blast performance and productivity. We will work with you on providing samples. Please submit a request through our Contact Request page for more information. We suggest two blasts with and without VARI-STEM, while alternating the shots for an average comparison. 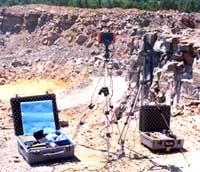 Once increased fragmentation is proven, the quarry or blaster can test stemming height reduction using VARI-STEM to control oversized cap rock boulders. MOCAP would prefer not to supply VARI-STEM for split (½ and ½) shots because of inconsistent rock structures, and because we believe this is not a fair way to evaluate overall plug performance. We recommend you measure the performance of our plugs by filming each blast with a high-speed camera and by monitoring the tangible and intangible downstream costs and affects. The high-speed camera will allow you to view the blast in milliseconds looking at such things as - vertical and horizontal swell, face swell, stemming ejection, etc. The downstream cost and effect monitoring of VARI-STEM allows you to address the questions below. MOCAP would prefer that videotape not be used as the only analysis tool. Videotape can only provide a quick view of the air blast. Although videotape is better than simply “eye-balling”, it does not permit a slowed down millisecond review of the blast. Remember millisecond (ms) delays in containment result in increased fragmentation (per both MOCAP and industry studies). Has your oversized rock (cap rock) pile been reduced and become smaller? Are you spending less time and labor on secondary breakage (drop balls, hydraulic hammers)? Are you processing more blasted rock through your primary and secondary crushers? Has crusher maintenance and downtime been reduced? Are crusher wear parts lasting longer? Have your electrical costs reduced? Have your air blast and fly rock incidents decreased? Are you getting fewer blast complaints from your neighbors and community?